Matty Bowen says he would be willing to stay at Wigan Warriors next season. The 32-year-old Australian full-back agreed to join the Warriors in September, signing a one-year contract with the option of a further year. Asked if he wanted to remain at Wigan in 2015, he told BBC Radio Manchester: "It's up to Wigan and me to see if I want to stay, but I'm keen to stay. "I'm enjoying my time here and the family are enjoying it. As long as they're happy, I'm happy." Bowen was signed as a direct replacement for Sam Tomkins, who joined NRL side New Zealand Warriors for a world-record fee at the end of last season. He admitted that he initially struggled to adjust to the north of England, a huge contrast to the lifestyle he had become used to while based in Townsville playing for North Queensland Cowboys. Coach Shaun Wane suggested Bowen could improve on his early performances for the Warriors by 50%, and since then he has helped Wigan continue their run of consecutive victories, which now stands at eight. Fourth-placed Wigan face Super League leaders Leeds Rhinos at Headingley on Friday. 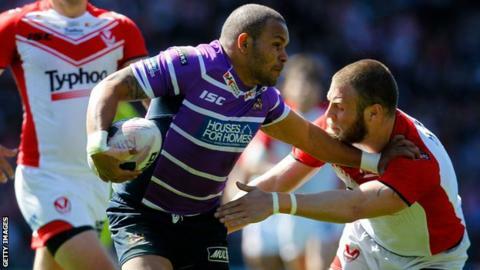 Read more on Matt Bowen: Can Wigan's new signing replace Sam Tomkins?